A major festival in Bristol has announced it is in "financial crisis" and is appealing for public donations to cover a £100,000 debt. 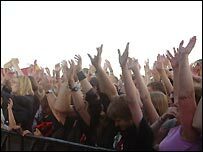 Ashton Court Festival organisers blame poor turnout and increased costs for licensing and security. Neil Barlow, from the festival's management committee, said: "It really is crunch time and we desperately need the support of the community." The festival may have to close without more financial support, he warned. "If we do not act now, by January it will be too late," Mr Barlow added. The committee says it faced an £8,000 bill for removing graffiti last year, and also had to pay £11,000 to cover vandalism costs. The festival is also looking for a new sponsor after Orange's five-year deal ended.